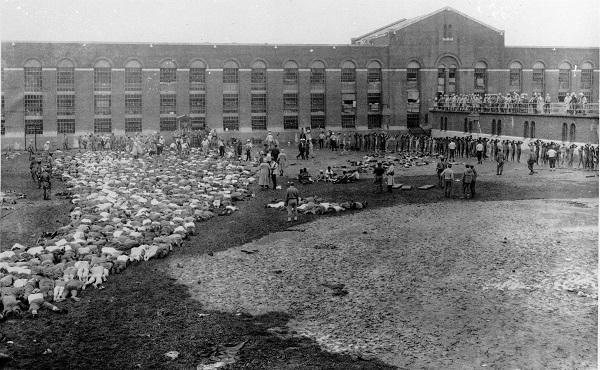 inmates of the Attica State Prison lie on the ground or are walked with their hands above their heads as authorities retake control of the facility after a riot and five-day siege by inmates at the prison in Attica, N.Y. Host Frank Stasio speaks with scholar and historian Heather Ann Thompson about her new book, "Attica Prison Uprising." Forty-five years ago, New York state police raided Attica Prison, a maximum-security institution in a small town in upstate New York. The standoff and takeover led to the deaths of 39 men in what has become known as the "Attica Prison Uprising." Scholar and historian Heather Ann Thompson considers the uprising to be both one of the most important civil rights events of the 20th century and a pivotal moment in criminal justice history. Yet many citizens know little about it. "Prison conditions today are much worse than they were in 1971." Thompson's new book "Blood in the Water: The Attica Prison Uprising of 1971 and its Legacy"(Pantheon/2016) documents why the history of the uprising has been kept so secret, and what seeds it planted for today's system of mass incarceration. Host Frank Stasio talks with Thompson in advance of her talks at UNC-Charlotte’s Center City Building tonight at 6:30 p.m. and at the International Civil Rights Center and Museum Thursday, Dec. 1 at 7 p.m.